NIST researcher Bryan Barnes and I discuss his contribution to MICRO/MACRO at the exhibit’s opening reception. His image shows patterns representing correlations among data taken while measuring a semiconductor device’s nanoscale features. I’m a graphic designer, or, in the language of the U.S. Office of Personnel Management, a "Visual Information Specialist." For the past 18 years I’ve been working at the National Institute of Standards and Technology (NIST), a federal laboratory where some of the best and brightest scientists, engineers, IT specialists, and mathematicians come together to do basic research, develop standards, create new methods of measurement, and win the occasional Nobel prize. In addition to designing exhibits, infographics, and brochures, one of my regular tasks has been to evaluate and process thousands of images created by NIST researchers to accompany the news articles my colleagues in the Public Affairs Office write. These images, which include micrographs made with scanning electron microscopes, photos of researchers in darkened labs working with lasers, and detailed data graphs, are critical in helping both the researchers and their audience understand their work. But then I thought, why not take that idea one step further? I figured that if I could gather enough amazing images, why not put them on display in a public space? The spectacular art would be the initial draw, but in the process, visitors would learn more about NIST and its important research. Lucky for me, my supervisor was interested in my idea and identified the perfect exhibit space at the Johns Hopkins University’s Montgomery County Campus, just a short distance from the NIST Gaithersburg, Maryland, campus. The campus hosts art exhibits year-round and is home to graduate classes in biotechnology and the liberal arts. There are also science labs from a host of research companies on campus. Having secured a location, I began the work of soliciting, collecting and curating images. Sure, I already had some favorites in mind from over the years, but I’d agreed to give JHU 20 high-quality images, and I knew that not all of my favorites were high enough resolution to be output at a large size for the exhibit. I put out a call to “artists” across NIST to send me any research images they thought were visually compelling and met the high-resolution requirements. I really didn’t know what to expect. Would any researchers here at NIST be interested enough in my project to take time away from their important work? I couldn’t have been more thrilled at the number of researchers who came through, offering up multiple possibilities, and going back to their archives to dig up more when asked. To my delight, there was a period of time over the summer when I never knew what visual treats awaited me in my email inbox when I got to work in the morning. 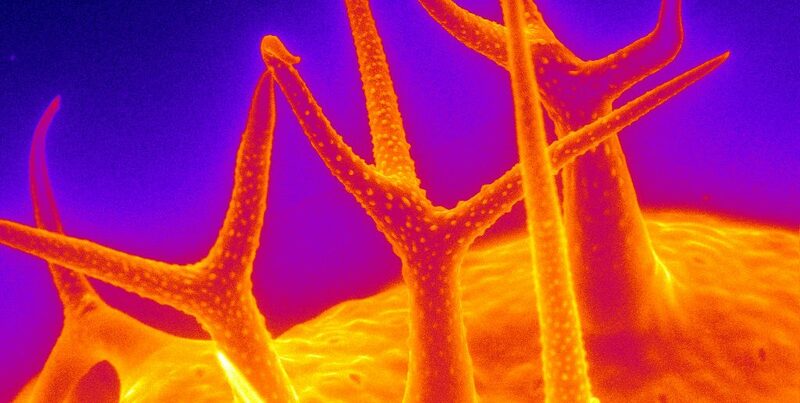 Colorized scanning electron microscope (SEM) image of trichomes, which are hair-like structures on plants. My hope is that this exhibit will reinforce the idea that science and art are not mutually exclusive; in fact, they can and should be used to enrich each other. When we apply the standards through which “traditional” art and design are evaluated (the principles of color, composition, balance, scale, symmetry) to images and visualizations from our labs, we can find some truly wonderful art that stands on its own. 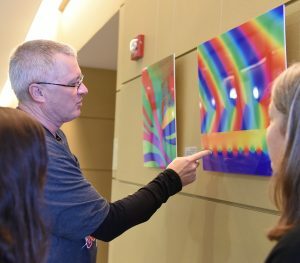 The exhibit, MICRO/MACRO: Big images of Small Things, will be on display from Sept. 6 through Nov. 11 at JHU in the lobby of the 9605 Medical Center Drive building in Rockville, Md. The exhibit is free and open to the public. Great minds think alike! We are planning on putting the whole exhibit online after the show ends, so please be on the look out! Hi Alan, I'll correspond with you via email. Thanks!